It's not you ... 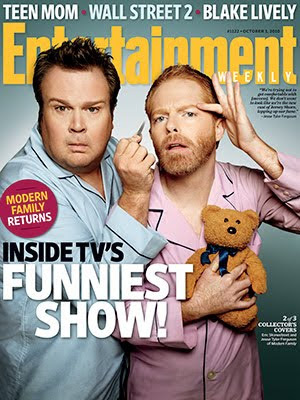 It's me: Jesse Tyler Ferguson & Eric Stonestreet Cover "Entertainment Weekly"
Jesse Tyler Ferguson & Eric Stonestreet Cover "Entertainment Weekly"
Modern Family's on-screen duo Jesse Tyler Ferguson and Eric Stonestreet are on the cover of this week's Entertainment Weekly! Watch Sofia Vergarawith her co-stars Ed O'Neill, Julie Bowen, Ty Burrell, Eric Stonestreet, and Jesse Tyler Ferguson trade parenting styles, secrets to successful shows and why no one sees Sofia as "motherly."